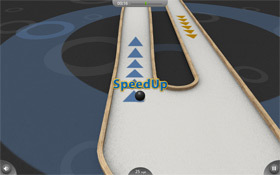 LaxBall uses your brain power to move a ball through 42 mini 3-D levels. The levels build on each other, each has to be completed to explore the next. This requires a more and more acute control over your state of excitation resp. relaxation. You master the levels by becoming a master of your thoughts and emotions. The interface between body and computer (PC and Mac) is the MindReflection with sensors. Attention: Delivery at the moment with functionally identical ThoughtStream! The aim is to get the ball to the final stretch as quickly as possible. For particularly good results you can receive virtual medals. Furthermore, a network feature allows you to compare your performance to all other players worldwide. A tutorial introduces you to the handling step by step. 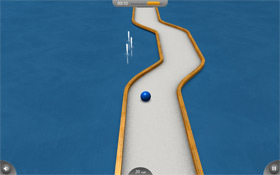 In this still very simple level you have to move the ball around a bend. If you touch the edge, the ball slows down. ... or to overcome obstacles efficiently. LaxBall is a game with unconventional control. 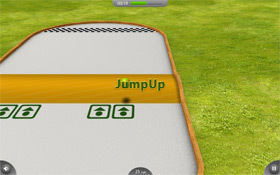 Unlike most other computer games, you control LaxBall only by brain power which is reflected in the galvanic skin response (GSR). We all know wet hands as a symptom of anxiety or panic. However, the skin is even more sensitive to all emotional reactions, which in turn can be influenced by thought. Already a single thought can be enough for a sustainable emotional response, which is reflected in skin resistance. Thus, the resistance of the skin is also an essential biofeedback parameter for lie detectors. 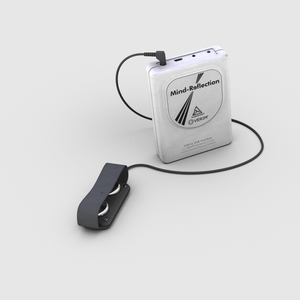 The LaxBall multimedia software analyzes the subtle changes in your electrical skin resistance, which are transmitted to your PC/Mac by the biofeedback device MindReflection. Initially the control of the reactions and the navigation of the ball are mostly unconscious processes: It is typical for biofeedback that you sometimes do not know how exactly you influence a response, but it works nevertheless. By and by you will develop a feeling for the correct responses. LaxBall's levels 'sense' your degree of concentration and relaxation and react accordingly. Combining biofeedback and multimedia provides new opportunities for personal development in a playful way. It opens a new dimension in personal training. Playing with LaxBall will help you to optimize your habits regarding perception, attention, relaxation and the associated reactions. You will soon find that increased awareness and attention lead to a more relaxed everyday life - without stress or even burnout.